Welcome to School Recipes - home of all the old classic school dinner recipes that you still have vague memories of! We say balls to Balls (Ed Balls of course!) and have unfortunately misplaced his new book telling kids what they must eat. Instead, what we have here is aimed more at us 'older children' who want to try and relive the good old days of school dinners. By that we certainly don't mean the stuff of recent years which has been a tad too close to fast food for our liking, but such intricate delicacies as 'Pink Custard', Manchester Tart and the like. So, be a child again and remind your tastebuds of how good the school dinners of the past were, or weren't, and try out some of the classic old, and not so old, recipes. If you have any of your own then we positively encourage you to submit them here along with any pictures you have taken of any cookery attempts. So, relive your old school days with School Recipes. School dinners. Fond memories for some, recurring nightmares for others! It most likely depends on when you were at school and which school you attended. We think the best school dinners hark back to the primary schools of the 70s and 80s. These two decades probably brought out the tastiest, lardiest, cheapest, most processed school dinners of all time - barring the not so edible guff of the last ten years or so. 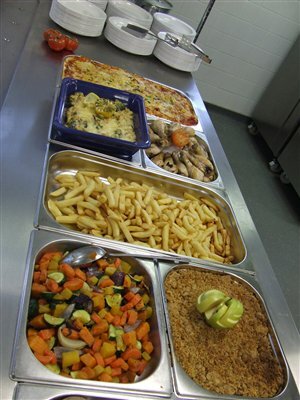 Our aim is to gather together as many of these classic school dinners as possible, all under one roof, to make us the most complete source of school dinner recipes aviailable. We have access to top secret (well, not really secret) typed and hand wriiten recipes on paper and parchment which, when we have the time, we'll keep on adding to the site. These pearls of school dinner wisdom will then be available to you to try your hand at. Of course, we'd also love to hear about any school dinners that you may have recipes for or variations of, so please drop us an email, add your own recipe, or post it up to our forum. Why Create an Account on School Recipes? Subscribe to our new automailer service and receive each new recipe direct to your email inbox! Request a Recipe! If you're after a partially forgotten classic, give us a clue and we'll try and find it for you! Add a Recipe.See your name in lights and attract the praise of other School Recipes users by adding your own recipe to our site. Add a Comment. Comment on what we've already got. If you think there's a better way of doing it, or adding your own twist, comment on our existing recipes. Chat! Sign up to School Recipes and you have instant access to our Discussion Forums where you can post questions, answers and general chat to your heart's content. I'm sure we'll also be adding other 'just for users' content as well, so why not Create an Account today? We will only email you stuff that you subscribe to and you can cancel at any time. So, what have you got to lose? With Christmas now a distant memory but with the effects of it longer lasting than maybe you hoped for, we thought we'd tell you a little about Tesco Diets - the complete antithesis to our beloved school dinner recipes! But, for those of you who have maybe overdone it a tad this year, Tesco Diets offers a cost-effective and innovative way to help shed a few pounds, or to make some more room for Cornflake Pie. So, why not have a quick look at the Tesco Diet programme by clicking here. School Dinners to be made Free? Free school meals are currently available to around 16% of children whose family income is below the current threshold for qualification. However, estimates have put the number of children missing out on school dinners due to cost at a staggering 400,000 - this means that they are not benefiting from a nutritional meal purely based on the cost. To try and help reduce this figure, the Government's Department of Children, Families and Schools is piloting free school meals for all - regardless of household income. Unfortunately, the seemingly omnipresent Jamie Oliver thinks this is a bad idea and will lead to the school dinner standards dropping. Why this would be is anyone's guess, as the more children taking up a cooked school dinner means more money for the school caterers which should in turn be reinvested back in to the dinner programme. Before a universal roll-out were to happen, a £20m pilot scheme is taking place in two especially deprived areas which will monitor the effect of free meals for all on children's health, behaviour and academic standards over a period of two years. The Scottish Government have already announced that from August 2010 all five to seven year-olds will have school dinners for free, following a successful pilot scheme which saw more children opting for dinners and becoming willing to try unfamiliar healthy foods. Your Favourite Type of Crunch?